Buy Liqua eLiquid - Berry Mix 30ml in Melbourne, Australia. Free Delivery* and Discount. 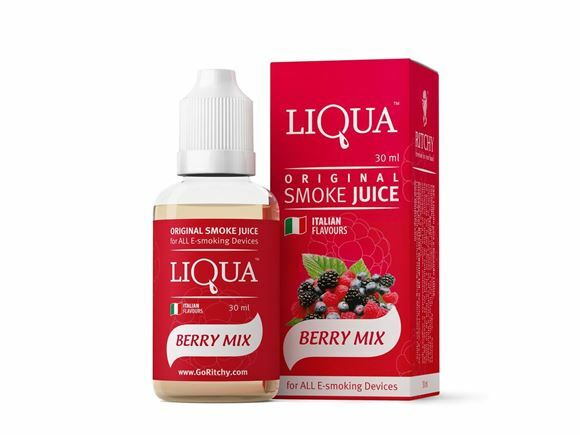 So what is Liqua eLiquid - Berry Mix 30ml? Berry Mix offers you a rich and invigorating taste that has an exceptionally unique flavor to start with and tender towards the end. It has a profound yet rightly adjusted taste of all your top choices together with one not overwhelming the other, permitting you to delight in the greater part of the crisp tree grown berries together with - strawberries, fruits, grapes, and citrus will amuse you. eLiquid Berry Mix offers a rich and unique flavor that is succulent and different initially and afterward delicately sweet at last. Profound and adjusted taste of the strawberries, fruits, grapes and citrus provides for you a delightful experience for regular vaping. LIQUA e-liquid ingredients (Propylene Glycol, Vegetable Glycerol, Flavors and Nicotine) withstand the highest standards of production set by United States Pharmacopeia. All liquid pass thorough SGS reports. Purest Nicotine has no tobacco components inside and is protected from any oxidation during manufacturing. LIQUA’s full range of tastes are designed carefully by those who really know what theyshould be – the most professional flavorists from Italy. That means LIQUA’s Tobacco taste is truly right - as fresh as natural leaf Tobacco. LIQUA Berry Mix flavor is as juicy as a real green Berry Mix, and LIQUA Coffee – tastes as good as what you’ve got in your morning cup. LIQUA’s plastic container is made of food grade transparent PET that keeps theLiquid fresh and consistent. It’s sturdy material will keep LIQUA from leaking, and a childproof cap keeps it safe from those curious little hands. Enjoy recharging your electronic cigarette in just a few seconds. Our specifically designed silicone spout and soft bottle structure perfectly fits all e-cigarette starter kit tank system as well as open-type cartridges (eGo, 510, Kanger AeroTank Mega, Aspire CE6). UseLiqUA Smoke Juice to refill your device and experience hassle free vaping. LIQUA E-Liquid Smoke Juice flavours withstand the highest standards of production set by United States Pharmacopeia and use only USP ingredients and European food flavours. Our customers always thinking where to buy Liqua eLiquid in Perth, Australia? and the answer is eCig World is the only place where you can get discount and free shipping with Australia wide express delivery. We sale broad range of products including Cards Against Humanity, Electronic Gadgets, Party Games, Toys, Gifts, Apparel, Home & Outdoor, Office Supplies, Computers & IT, Personal Care, Fashion Apparel & Accessories, Health & Fitness, Baby and Kid’s items, Pet Supplies and more. We have full range of Cards Against Humanity (CAH) set including Australian and US main set, 1-6 Expansion Pack, Bigger Blacker Box, 90s and Holiday Packs as well CAH parode Crabs Against Humidity sets with Never Before cards. Copyright © 2019 DiKudi. All rights reserved.